We have a black stool in our kitchen. Growing up, I had a white stool that was almost identical to our black stool. We were on it constantly – helping mom with dinner, sitting making the shopping list, sitting and chatting, climbing up to reach the cabinet on top of the fridge, another chair for at the table – that stool was a lifeline for our family. I remember when our original stool (yellow maybe? cream? started out white?) died and Dad couldn’t fix it for the millionth time and we had to get a new one. We were amazed how the new one didn’t squeek and had some cushion on the back and seat. I always said I wanted to have a white stool in my kitchen. When Patrick’s Grandpa Leo passed away a few years back and we went to his apartment to help pack everything up, I was floored to see a black stool in his kitchen! I immediately asked if we could take it. No one else wanted “that silly old stool” so before anyone changed their mind I hauled it down to the car. Now keep in mind, we drove to South Dakota in our little silver car, but it HAD to fit (and did across the backseat – barely but it did!). And so started the story of the black stool in our kitchen. Today, Sig climbs up on it to see what I’m up to at the counter, help get dishes out of the cabinet (nice effort but ugh), and wash her hands or help me wash dishes at the sink. She is growing to love that stool as much as I still love (and she now loves) the white stool at my parents house. 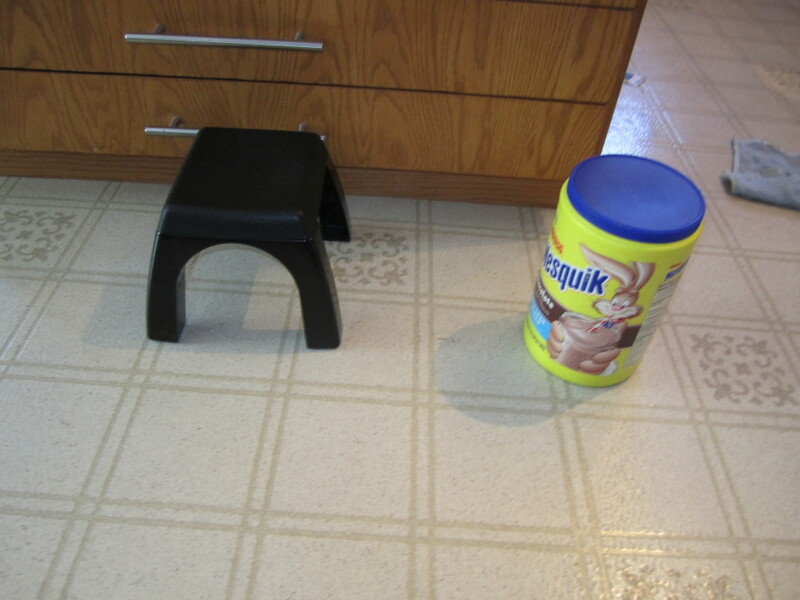 So this morning Sig brought me the Quik powder to make her chocolate milk while I was cleaning up in the living room. I asked her to please take it to the kitchen and put it on the black stool. She looked at me, processed what I said and said “Ok” and off to the kitchen she went. She put it down in front of the garbage cabinet and went back out to the living room. I was so confused – what part of “take it to the kitchen and put it on the black stool” was confusing? That’s not where the black stool is. Then she comes back to the kitchen, proudly carrying her little black step stool she has that she carries all around the house and uses to reach things out of her reach like the top of her little kitchen. She marches over to the Quik and puts it down next to it, turns to me and says “All better” (comes out as a very serious “all bubba”). I had to tell her good job because she pretty much did what I told her to do, I just hadn’t realized she had another black stool she uses as a lifeline. 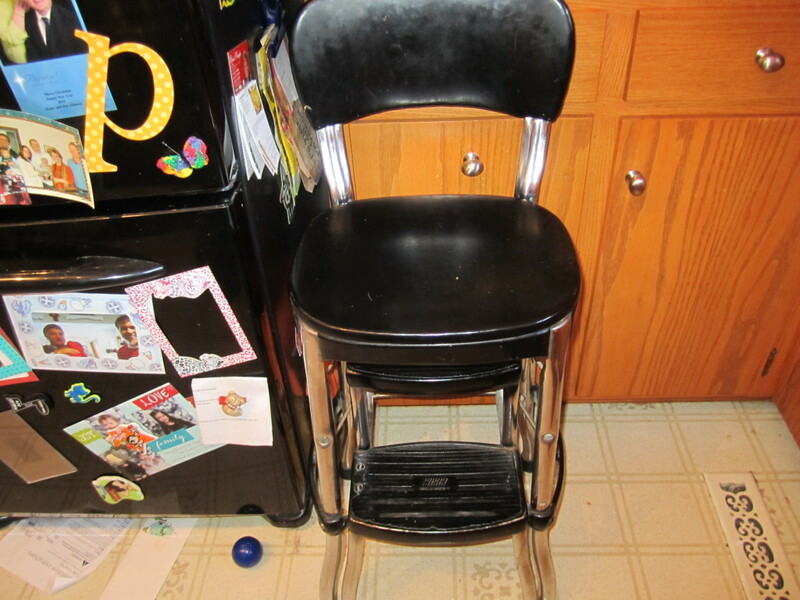 So now I have two black stools in my kitchen. Such a big helper. I am constantly amazed by her problem solving, interpreting what we are saying and her continuing-to-develop independence at age 2. 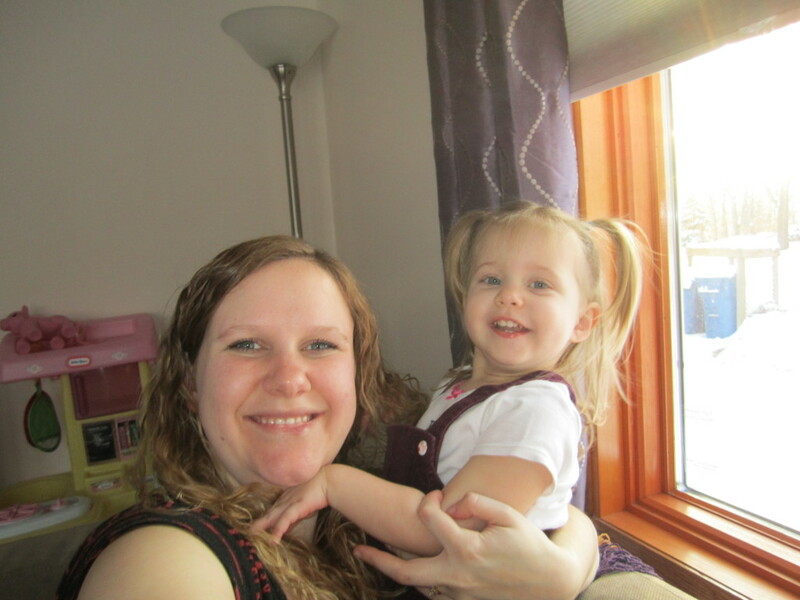 I just love her – even when she tries to throw herself over the back of the couch rather than take a picture with me!! This entry was posted in House, Just Funny, Signe. Bookmark the permalink.